Magnifique et Neuf Bracelet LONGCHAMP Ligne Roseau Cuir Façon Croco. De couleur Beau Bleu Foncé. Une Touche finale de votre tenue. Matière : Cuir de vachette Facon Croco Superbe Fermoir : Métal Argenté. Dimensions: Longueur totale avec fermoir Roseau 20.5 cm - Largeur ou Epaisseur 3 cm. État : Neuf avec sa housse. Bonnes enchères !! LONGCHAMP Roseau Croco. Magnifique sac en cuir gris. Sac longchamp cuir croco marron reflet acajou. Porté main. Joli sac en cuir ligne roseau façon. Croco longchamp. Superbe sac à main cabas en cuir façon croco gris LONGCHAMP Roseau avec son dustbag (sac en tissu de protection) Authentique, récent et introuvable Etat proche NEUF ! Porté main, fermoir argenté, gros roseau, 1 grande poche zippé intérieure, 2 petites poches intérieures, doublure intérieure "papillons". Dimensions : 34cm X 25cm X 10 cm Envoi offert et soigné. Merci. Authentique Sac longchamp porté main ou épaule en cuir frappé croco couleur grenat (la première photo est la plus proche couleur). Beau sac Longchamp porté main et épaule modèle roseau façon croco. En bon état. largeur: 30,5cm. Authentic Longchamp Roseau Tote Shoulder Handbag. Colour: mahogany. Pattern: crocodile embossed. Embossed Horse Logo. Shoulder Strap Drop: 21 cm. Double Shoulder Handles. Zipped Inner Pocket. LONGCHAMP Leather Roseau Purple Bag. Roseau Crocodile-Embossed Shoulder Bag, Purple. By 1955, Longchamp expanded to include small leather goods, opening its first factory in Segre. Longchamp Bag. Crocodile embossed leather gives this spacious Longchamp tote a luxurious finish. 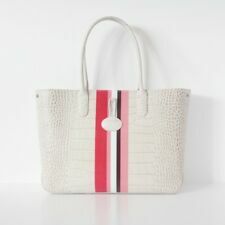 Authentic Longchamp Roseau Club Stripe Tote Shoulder Handbag. Colour: ivory. Material: leather with fabric lining - polkadot pattern lining. Shoulder Strap Drop: 21 cm. Double Shoulder Handles. Zipped Inner Pocket. MATERIAL : Rindleder mit Kroko-Optik. Die aus Vachette-Leder in Krokodiloptik neu interpretierte Taschenlinie Roseau Croco bekundet ihre Kühnheit und ihren Charakter in exotischen, glamourösen Modellen in zeitgemäßem Design mitunbearbeiteten Kanten sowie abgerundeten und zugleich strukturierten Kurven. The roomy interior easily accommodates your tech and other essentials, while the bag's clean lines, soft structure and sleek, signature toggle make for a richly stylish look. Silver color leather. Main Material:L eather. Gorgeous gently preowned Longchamp beige 'Small Roseau' croc-embossed leather tote. Magnet and toggle closure. Very minor signs of wear to edges - see photos. In very good condition - with interior and zipper slightly yellow. ~~~~~~~~~~~~~~~~~~~~~~~~~~~~~~~~. This is a lovely bag from Longchamp Paris in good condition. It is from the Roseau collection. The handles are long enough for wearing on the shoulder. It has inner pockets and is clean. Longchamp Roseau Croc Embossed Tote Brown Leather Silver Toggle Shoulder Bag MEDIUM Size Authentic-NEW. The roomy interior easily accommodates your tech and other essentials, while the bag's clean lines, soft structure and sleek, signature toggle make for a richly stylish look. Double handles:approx. Main Material:L eather. A silvertone toggle closure shines against the glazed, croc-embossed leather that comprises a streamlined crossbody bag suspended from an adjustable strap. Logo-jacquard lining. TOGGLE WITH. SHOULDER BAG. BROWN LEATHER. 10" STRAP DROP. GENUINE LEATHER. INTERIOR SLIP POCKETS. SINGLE HANDLE. FULL ZIP-TOP CLOSURES. Silver toggle on front, longchamp embossed zipper pulls. Crocodile Green Croc Embossed Leather. Logo lined satin interior with one large full width zipper pocket and three slip in pockets. Three Sided zipper closure. In brown croc style leather. PREOWNED Minimal signs of wear. side W 3.5" at longest point of bag, bag tapers up. From lowest point of half moon zipper closure of bag to base 8" H. Original dust bag not included. Style: Roseau Croc Embossed Leather Crossbody Bag. By Longchamp; made in Mauritius. A silvertone toggle closure shines against the glazed, croc-embossed leather that comprises a streamlined crossbody bag suspended from an adjustable strap. ITEM: Small Roseau tote. Bag features Roseau bamboo clasp, silver tone hardware,interior open and zip pockets. lined with beautiful butterfly Longchamp fabric. Material: Croc Printed Calf. COLOR: Purple. Faux croc pattern in leather. Snap button on each side to widen the bag, if desired. One zippered and three open pouches inside the bag. NO RESERVE. Featuring a single leather top handle, zip and toggle top closure, silver tone hardware and two open and one zip interior pockets. Brown signature textile lining. Style: Tote / Shoulder Bag. A classic and practical bag. Featuring a single leather top handle, zip and toggle top closure, silver tone hardware and two open, one zip and one cell interior pockets. Tonal jacquard lining. Style: Tote / Shoulder Bag. Leather has small black marks on the bottom otherwise still in great condition. Longchamp shoulder bag. Croc Duck Blue. Inside 4 pockets-3 are flat pockets 1 is a zip pocket. Dust back included, no box. Lining in excellentcondition. Item is used but has no visible signs of wear.